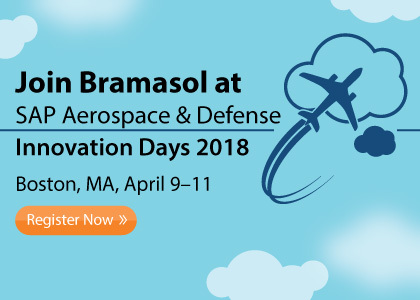 Bramasol Inc. is excited to announce that we will be participating at fifth SAP Aerospace & Defense Innovation Days 2018, at the Edward M. Kennedy Institute in Boston, MA!. Plan to join Bramasol and learn the latest about our technology innovations and solutions for challenges facing the Office of the CFO. We will join the discussion with over 200+ A&D industry peers to drive innovation and identify growth opportunities. In this event, discover how to make sense of technology, and learn from a complete program of showcases, presentations, and customer sessions. We will enjoy invaluable networking opportunities with SAP executives and experts, customers, and partners. Hence, Bramasol encourage you to join the fifth SAP Aerospace & Defense Innovation Days, April 9–11, 2018.